The global glass fiber market is anticipated to reach US$17.44 billibn by 2024, from US$8.50 billion in 2014. The market could expand at a CAGR of 7.5% between 2016 and 2024. Glass fiber is the most widely used reinforcing material in composites across the globe and accounts for a more than 90% share of reinforcement materials used in fiber reinforced plastics. Glass fiber offers qualities such as low weight, high strength, and impact resistance when compared its substitutes. Demand for glass fiber is high in end-use applications such as building and construction, transportation, consumer goods, industrial and wind turbine. Asia Pacific held the major share of the global glass fiber market and accounted for more than 45% volume share in 2014, followed by Europe and North America in 2014, due to growth in the building and construction industry. Demand for renewable energy in Asia Pacific could also increase wind turbines installation, which in turn, could augment the demand for glass fiber in the near future. 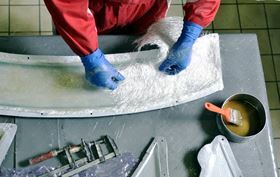 In Europe, automotive manufacturers’ requirement for lightweight alternatives over traditional materials has helped maintain the demand for glass fiber in the region. China is currently the largest manufacturer of glass fiber in the world, constituting more than 50% share of the global production. The glass fiber industry in China receives subsidy grants from the government, which enables it to export glass fiber at low cost to Europe and North America. This has compelled the European Union to impose anti-dumping duties on Chinese products. Thus, demand for China-made glass fiber is expected to decrease in the near future, resulting in overcapacity in Asia Pacific. This could lead to price wars in the region. The new report, entitled ‘Glass Fiber (E-class Glass Fiber and Performance Glass Fiber) Market for Building & Construction, Transportation, Consumer Goods, Industrial, Wind Turbine, and Other Applications’, is published by Transparency Market Research. This story is reprinted from material from Transparency Market Research, with editorial changes made by Materials Today. The views expressed in this article do not necessarily represent those of Elsevier.